I absolutely love comic conventions, but Jon and I have really cut back on what we go to. There is a tour of Wizard World that comes through Philadelphia but it is so expensive just to get through the door and it gets so crowded that it's a bit overwhelming to go. 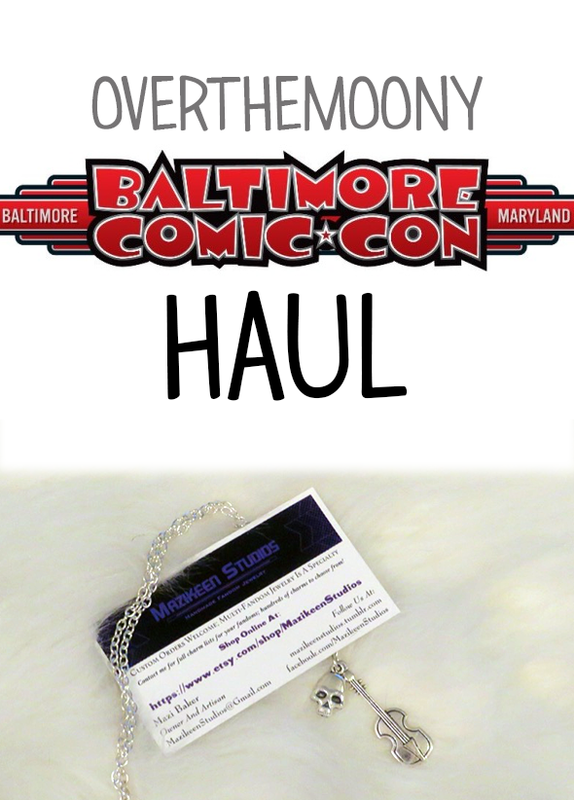 The only one we seem to go to regularly anymore is Baltimore Comic Con. We're both really big on getting custom sketches and this Con is really artist heavy. There's tons of vendors and bunches of comic book stores. The Con was this past weekend and, despite my trepidation about going through insane amounts of traffic from the Pope being in Philadelphia (I live about 5 miles outside of the city), we made the trek. Luckily the traffic was nothing and it was an easy trip! Let's look at everything I got! This place had some seriously beautiful jewelry. Everything was charms and obviously based on famdoms, some based on multiple fandoms. The girl that I got to speak with was insanely nice. I was wearing my Sherlock Drunk Observations Shirt from Human and we started chatting about Sherlock. She was telling me about a couple different cons in Washington and Atlanta so I'm going to have to check those out! They didn't have all of their Sherlock merchandise at the Con but after looking through the Etsy shop, I'll definitely be getting more! I remembered this vendor from last year but I feel like she was a bit more picked over last year. This year, I couldn't say no to Poison Ivy since she's one of my all-time favorites. There was also a giant Rocket Raccoon that was really hard to say no to but he would have been a bit much to carry around so I stuck to just my one! Jon went knock-off Lego crazy. There were three or four huge tables with Lego-type products and mini figures so he got me this little Thor knock-off. He came with handcuffs but we weren't sure why. Jon chalked it up to the Thors comic book but I let him keep thohse in his extra pieces. Again, this is another vendor I always remember seeing but never actually going over to for some dumb reason. Her booth is always super pretty and she has an abundance of foxes, unicorns and cats. What took me so long I can't tell you, but I stopped over there and I was so happy I did! I love these little foxes so much. The prints are so whimsical and cute. I love the sparkly Angry Cat bookmark and the sweet little fox bookmark. She has another shop here that has the adorable Angry Cat scarves and some more of the cute little fox. Sara Richard is hands down no questions asked my absolute favorite artist. Her work is beyond stunning and I've been an admirer of her's for years. She does a lot of work for IDW and you can usually see her doing work on My Little Pony or Jem. I saw her at Baltimore Comic Con a couple years ago on my way out of the Con when I was out of money so I couldn't get anything from her. The last time Jon and I went to Wizard World I got a super pretty Princess Jasmine print (my favorite Princess!) and promptly hung it up in my living room. This time I was determined to get a commission from her, which I did, but she was backed up on commissions so she took it home with her and is going to mail it out to me. I cannot even wait to see the magic that she creates! In the meantime, I picked up these little mini prints. I'd seen them both online and loved them. It's just going to be tough trying to choose which side to display! One of my favorite things about Cons is stumbling upon new artists. If you've ever been to a Con, you know how overwhelming they can be. It's just tables upon tables upon tables of art and, honestly, after you're looking at so people, their stuff starts to blur together a little bit and look the same. Then there are people where it feels like the crowds part and their stuff just calls to you. That was 100% the case with this artist. I was drawn in because she had this beautiful Poison Ivy print, as well as a kickass Storm print which I will definitely be getting at a later date. But this Kiss The Girl print called to me and I needed it. It needed to be hanging up in my apartment with Jasmine and it needed to be mine. And now it is. I think it is so stunning! I'll be on the hunt for a frame this weekend! I was walking by this table and was like oh, cute plushies! And then, in the corner, there was a catnip display. Being that I love my cats more than most things and people, I needed to get them a toy! This one is the one I got for mine (which, as you can see, I wasn't able to get out of the bag before they decided to start playing with it), and I got a Deathstroke one for Jon's new cat Girl/Streaky The SuperGirl Cat. All cats give this the claws up. While we were at the Con, we met up with our friend Erik who used to live with Jon but moved back to Virginia. We were talking and he started telling me about this girl Katie Cook and took out the tiniest little card with the most adorable Umbridge watercolor sketch on it that he got for $10. He was saying how she just whips these things out in seconds and loves Harry Potter. He needed to take us to her. We got there and she was doing a panel until 3:00 and wasn't taking anymore sketches. Sadface. Jon and I were on our way out anyway so we weren't going to wait until 3 for her to come back. But I decided I'm going to cyber stalk her, which I already have and oh my goodness her Harry Potter art is so beautiful. Next Con I will be on the lookout for her and will probably be stocking up on prints before that! So that's my haul. I did manage to not spend all of the money that I took down there, which is rare, so I was proud of myself. I love everything that I got, too! Did you go to any Cons this weekend? I know there's always tons going on on any given weekend. Let me know what you picked up! Katie . 31 . NJ, USA . Slytherin. Child At Heart. Collector. facebook . instagram . twitter . pinterest . flickr . bloglovin .